BUILD ‘EM UP STRAIGHT SETS. The straight sets are compound movements that EMG research has shown to be effective for recruiting the glutes. Make sure to challenge yourself by using the heaviest weight you can safely use while completing all of the specified reps and maintaining proper form. This will facilitate muscle growth. MAKE ‘EM BURN FINISHERS. After you have completed the straight sets, you will perform a tri-set and then a finishing exercise to exhaust the glutes. You should minimize rest between the exercises and feel a deep burn in the glute muscles. Start on your hands and knees. Keeping knee bent, lift one leg up and drive the heel to the ceiling. Put a resistance band around your knees and lie on your side. Bring your knees to a 90-degree angle to your torso. Keeping your feet together, lift your top knee as high as you can. Lower and repeat. Begin seated on the ground with a bench behind you. Place a barbell on your lap and lean against the bench. Lift your hips off of the ground and position feet such that your shins are in line with your ankles. Then, thrust your hips up vertically— your shoulder blades and feet should be supporting your weight. Slowly lower and repeat. Holding a dumbbell in each hand, place your left foot on top of a bench/box. Pressing through that foot, straighten the leg to stand on top of the bench/box. Then, in a controlled motion, lower the right leg back down to the floor and keep the left leg on the bench. Repeat all reps on the left before switching to the other side. Stand in a lunge position with the Smith Machine bar resting on your traps. With your weight focused in the front heal and the back foot lightly touching the ground behind you for stability, lower into a squat. Pressing through the front heel return to the starting position. Complete all reps on one leg before proceeding to the next. 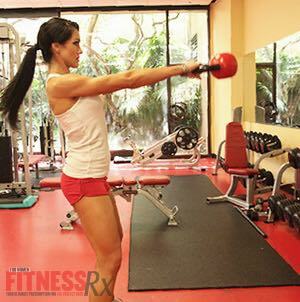 Begin with legs about shoulder-width, grasping a kettlebell with both hands. Push glutes back, bend forward at the hips and let your arms swing backward through legs. Then drive hips forward to swing kettlebell to shoulder height. Your body should be in a straight line at the top of the swing. Using a hyperextension bench, position one foot on the platform secured behind the ankle pads. The other leg should be outside of the platform. Keeping your back flat, bend forward slowly at the waist. Then, slowly raise your torso back up using your glutes and hamstring. Add weight for a more advanced movement. Sit and a bench and extend one leg forward in the air. Pressing through your heel, straighten the other leg to stand up. Then, slowly lower yourself back down to the bench. Repeat all reps on one side before moving on to the other. With a resistance band positioned around your ankles, hold dumbbell goblet-style. Then, take a step out with the right leg and squat. Bring the left leg in, but keep tension in the band. Take another step out to the right and squat. Continue the lateral squat walk to the right for all the reps. Then perform the same motion to the left. 1. Push through the heels in any exercise you can (i.e., squats, lunges, presses, step-ups) to better target the glutes. Really think about the area you are working! 3. Perform sprints and plyometrics as part of your cardio. 4. Keep constant tension in the muscle when training. When the exercise starts burning, KEEP GOING! 5. Don’t be scared to use heavy weights for your glute training, but make sure to keep the contractions in the targeted muscle. Don’t use such heavy weights that other muscles in the legs take over. 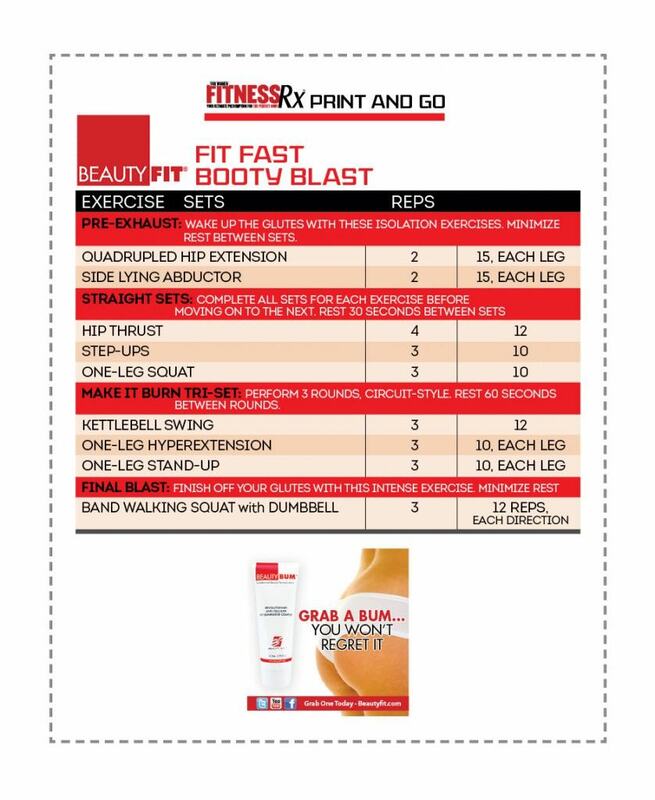 Fit Fast Workouts brought to you by BeautyFit. Simenz, C. J., et al. Electromyographical analysis of lower extremity muscle activation during variations of the loaded step-up exercise J Strength Cond Res. 26(12):3398-3405, 2012.